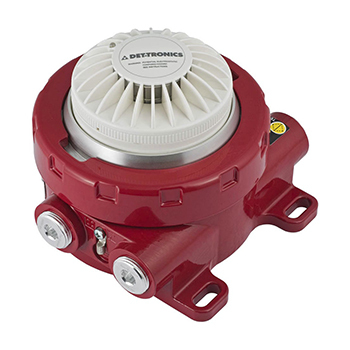 The Det-Tronics® SmokeWatch™ U5015 Explosion Proof Smoke Detector has Division and Zone explosion-proof ratings and is suitable for industrial and commercial applications. The SmokeWatch smoke detector is designed to operate effectively with smoldering and rapidly growing fires and contains the ability to annunciate fault ensuring no undisclosed failures. The U5015 Smoke Detector outputs include 0-20 mA, a localized LED, and relays.